Alongside a fresh and invigorating aroma, the combination of grapefruit and fennel in this handmade soap offers natural soothing, antioxidant properties. 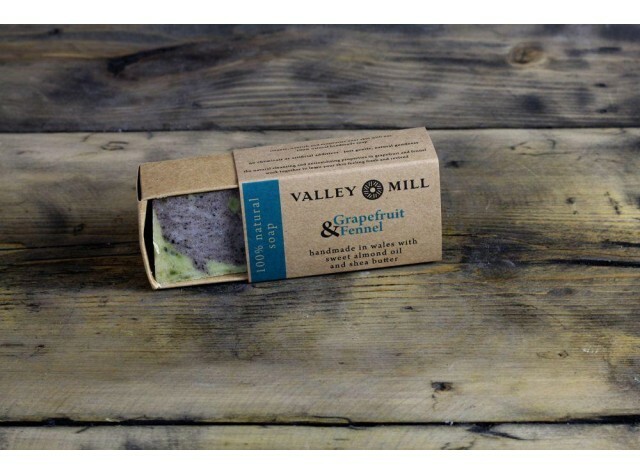 Valley Mill natural soaps do not contain artificial colours, preservatives or additives and are free of parabens and SLS; they are just full of natural goodness. They're cruelty free too! Sweet Almond Oil, Coconut Oil, Mango Butter, Olive Oil, Shea Butter, Castor Oil, Fennel Essential Oil, Grapefruit Essential Oil, Spinach Powder, Cinnamon Powder. Although Valley Mill has been manufacturing Welsh slate products since 2007, their natural handmade soaps weren't created until 2012. Handmade in our Crynant workshop using our own unique blend of natural ingredients, our soaps contain no chemicals or artificial additives - just gentle, natural goodness.